San Francisco is going to burn if the coveted princess of California’s criminal underworld isn’t returned to her family in one piece … Avery Capulet is missing. Taken by a madman. Kept in the dark. She might not survive. He’ll use her body. Destroy her mind. All before he ever lays a hand on her. Rome Montague is a drug dealer. A criminal. A thief. And he needs the secrets Avery and her family are keeping – even if it means cutting them out of her pretty Capulet flesh. Rome Montague is missing – but nobody will miss him. Not that it matters; After the things he’s done to this girl, he doesn’t deserve to be found. 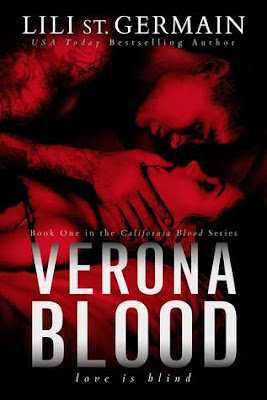 * * Prepare to step into the dark and bloody underworld of California, as Lili St. Germain brings you a modern retelling of Romeo and Juliet, in the same vein as her bestselling Gypsy brothers series. The CALIFORNIA BLOOD series, set in the criminal underbelly of San Francisco, follows two warring families who are ruled by blood, power and twisted desire. If I could some this book in one word it would be intense but I've come to expect nothing less from this author. by the author. I read this book in one sitting in fact I'm not sure I moved from the chair once. It was fantastic, addictive and compelling and with a cliffy to end all cliffhangers. I need more ASAP. A twisted tale of blood enemies, it's absolutely addictive. It's Romeo and Juliet in a way you've never experienced them before. It's crazier. It's more violent. It's everything you would expect from Lili St. Germain. It's also a cliffhanger of the most frustrating kind. The kind that leaves you twitching and heaving for more. Sigh...patience is not my strong suit! I need more Capulet and Montague ASAP!!!! Lili writes books about vengeful girls and villainous men. Her USA Today bestselling Gypsy Brothers series focuses on a morally bankrupt biker gang and the girl who seeks her vengeance upon them. The Cartel series is a prequel trilogy of full-length novels that explores the beginnings of the club, to be released worldwide in print and ebook in 2015 by HarperCollins. Lili quit corporate life to focus on writing and so far is loving every minute of it. Her other loves in life include her gorgeous husband and beautiful daughter, good coffee, Tarantino movies and spending hours on Pinterest. She loves to read almost as much as she loves to write.